The documentary movie Backpack Full of Cash touches on every aspect and challenge of public education that's in the daily news — from under budgeting to overcrowding. That's why Dr. Terrill Saxon, Baylor School of Education Interim Dean, saw the film as a launching point for important conversations. The film is available only through sponsored presentations, and the School of Education hosted two well attended showings in September &mdash; at the Mayborn Museum's SBC Theater as part of Baylor Movie Monday program and an encore presentation the following evening in Marrs McLean Science Building. 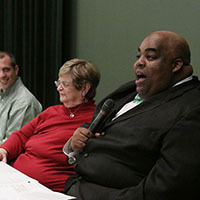 After the Movie Monday showing, four education experts participated in a panel discussion, which you can watch online at&nbsp;baylor.edu/SOE/panel. "Today, here in Waco, Texas, it's embarrassing that you can predict student outcomes by zip code. That's just not right," said Dr. Marcus Nelson, superintendent of Waco ISD, during the panel discussion. Nelson (pictured, far right) was joined on the panel by (left-right) Dr. Alexis Neumann, PhD &rsquo;10, superintendent of Rapoport Academy, a local nonpofit charter school system; Dr. Matthew Polk, executive director of Prosper Waco, a nonprofit dedicated to improving health, education and financial security of Wacoans and a former superintendent of Rapoport; and Dr. Bonnie Lesley, former assistant superintendent in Waco ISD and co-founder of Texas Kids Can&rsquo;t Wait, a public school advocacy group. Polk suggested that school funding issues extend beyond charter schools. "It was an interesting path the film took starting out talking about charters and vouchers and ending on the issue of education funding," he said. "The bigger question is, as a country and as a society, how comfortable are we with inequity?" Neumann said the smallness of the Rapoport charter system allows it to be nimble in addressing student need through curricular and other changes, and she challenged the film's portrayal of charters as islands of privilege. "We do not exist in a place of high money and low accountability," she said. Lesley said the film should have delved more deeply into the motivations behind "so-called school choice,"; saying there is "big money"; to be made by for-profit charters. "If you look at the secretary of state's reports on political campaign contributions, you will see huge, huge contributions from charters and cyber schools to political candidates . . . We need to let them [legislators] know how we feel . . . ."
Nelson said charter schools do have an advantage in the funding formula. That's one reason Waco ISD launched an in-district charter to help its schools targeted by the state for low scores. "For the record, we got $5 million to experiment," he said. "Otherwise we are stuck with the same funding formula that hasn't changed since the '70s." 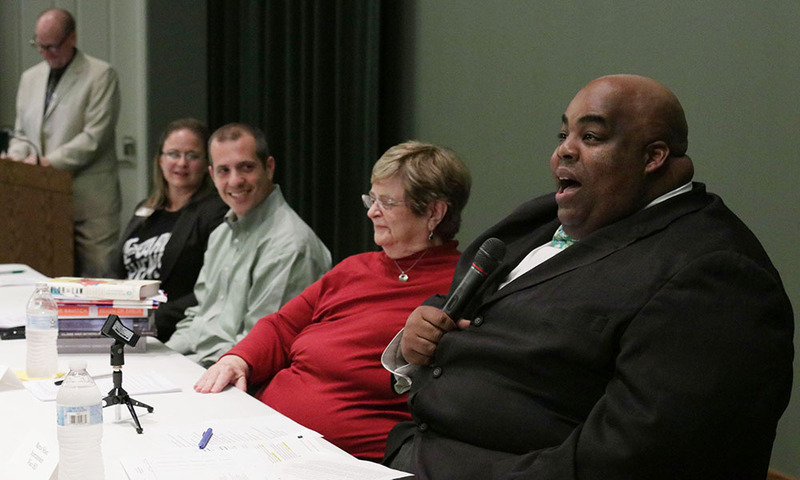 SOE associate dean Tony Talbert, PhD, who moderated the panel discussion, said the film offered a provocative look at the public school system and issued a "clarion call" to get involved. "Quite frankly, anything that undermines our fiduciary commitment to our public schools ultimately erodes the fidelity of our nation's democratic values," he said.